Welcome to the Fit Small Business Xero training course! In this lesson, we’re going to cover how to set up multi currency in Xero. Why Is it Important to Set Up Multiple Currencies? With today’s advanced technology, it’s pretty easy to do business with customers and suppliers located anywhere in the world. In today’s flat, hyper-connected economy, US small businesses can tap into customer bases and labor markets in any number of countries. It’s not uncommon to be billing a client in Germany for a project that utilized contractors from Brazil. Xero’s powerful multi currency accounting will help you bid, bill, and transact in the currency that’s most advantageous to your small business. Even better, the reporting won’t leave you cross-eyed since all your transactions can be reported in your native currency (USD). There are many benefits to using the multiple currency feature in Xero. We will discuss each of these in detail next. You must be signed up for a Premium Edition pricing plan in order to use the multiple currency feature. It is not available with the Starter or Standard editions of Xero. Your base currency is your default currency in Xero. Most of your reports will use this currency. This was set up in the Organization and Financial Settings lesson. You can add as many currencies as you need to (up to 160 currencies to choose from) but once you add a foreign currency you cannot delete it. How Do I Set Up Multi Currency in Xero? 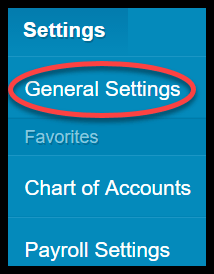 Step 1 – From the Xero Dashboard, navigate to General Settings as indicated in the screenshot below. Step 2 – In the Features section, select Currencies as indicated in the screenshot below. Step 3 – Click on the Add Currency button, as indicated in the screenshot below. 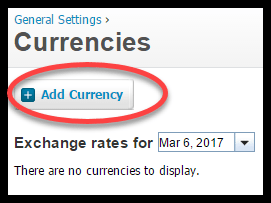 Step 4 – Select the currency that you want to add from the drop down and then click the Add Currency button to save. Repeat these steps to add additional currencies. What are the Benefits of Using Multi Currency in Xero? Exchange rates for over 160 currencies are updated on an hourly basis in Xero. This information comes directly from XE.com. With multiple currency, you can see the exchange rate that was used on a previously entered transaction, today’s exchange rate or run a report to see the conversion rate that was used for a previous transaction. As mentioned in the previous section, you can send and receive invoices, purchase orders, project bids and contract proposals in a foreign currency. For example, you can submit or receive bids in a foreign currency with the confidence that you’re accurately gauging the value in your native currency. Let’s say you bid on a project with a partner in Italy. The work will be done by contractors in Chile and India. Xero will do the calculations behind the scenes so that you can bill and pay all parties in their native currency but still track and run your reports in your native currency, (i.e. USD). While the exchange rates are updated hourly in Xero, you may have an agreed-upon exchange rate with your supplier or your customer that you would like to use instead of the current rate. You have the ability to change the exchange rate directly on an invoice or a bill. We will cover how to do this in the How to Invoice a Customer and How to Create a Bill lessons. Xero’s multiple currency feature allows you to manage your foreign bank and credit card accounts. Since the exchange rate is updated hourly, you always know the value of your foreign held assets in your native currency. This will allow you to make the wisest use of your funds. In the How to Set Up Bank Feeds lesson, we will walk through the steps of how to set these accounts up with the appropriate currency. Another benefit of using the multi-currency feature in Xero is the ability to set up an automatic default currency for your customer and vendor contacts. This allows you to view account balances in the foreign currency, and create new transactions that will automatically default to the currency that you have assigned to a customer or supplier. By automatically viewing the converted rates, you can ensure that you never send an invoice, submit a bid or pay a bill in a currency that would result in an over/underpayment. We will walk through how to set this default currency up in the How to Invoice a Customer and How to Create a Bill lessons. Xero automatically keeps track of all of the exchange rate calculations for every transaction so that you don’t have to. All of your reports display these transactions in your native currency, including foreign held assets. The same is true for all accounts receivable and accounts payable. However, there are 3 reports in Xero that can be displayed in another currency; the balance sheet report, income statement and budget variance reports. 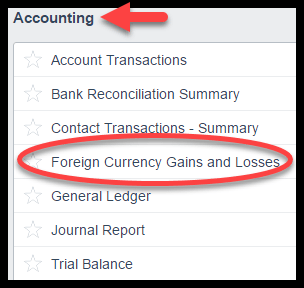 By default these reports will display in your native currency but you can easily change the report options to display the currency field where you can choose one of the other currencies you have set up for your organization. Finally, there are three foreign currency reports available for you to run in Xero. Each report is listed below, along with a brief description. To get to these reports just navigate to All Reports and select Accounting, as indicated below. This report shows your accounts payable, accounts receivable and bank accounts revalued in your base (home) currency. It also shows your organization’s current foreign currency exposure for each foreign currency you have set up. To get to these reports just navigate to All Reports then Accounting and the Foreign Currency Gains and Losses report, as indicated in the screenshot below. Step 1 – Navigate to All Reports. Step 2 – Select Accounting. 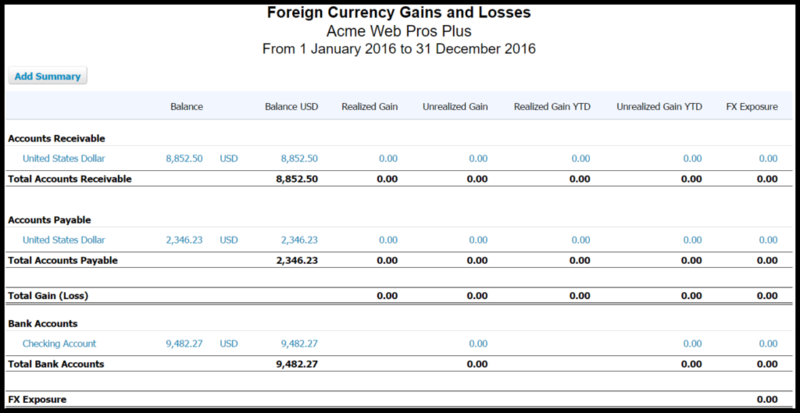 Step 3 – Here is a sample Foreign Currency Gains and Losses Report. This report shows the gains or losses for each transaction. To get to this detailed report, you have to drill down on the realized gain totals located on the Foreign Currency Gains and Losses report above. This report shows the current value on the gains or losses on current outstanding sales invoices or bills. To get to this detailed report, you have to drill down on the unrealized gain totals located on the Foreign Currency Gains and Losses report above. That wraps up the section on how to set up multi currency. The next lesson in our Xero Training Course will be how to set up sales tax rates. In this lesson, we will walk you through how to set up, track and pay sales taxes. To access this lesson or any of the others in the series, click here. For a free 30-day trial of Xero, click the button below.